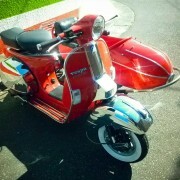 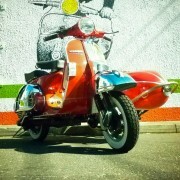 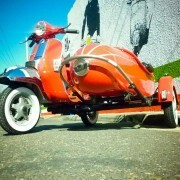 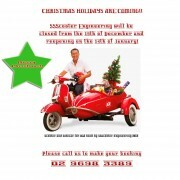 A new TV add was being made for a major supermarket and they needed a red Vespa and Side-Car built for them in 5 days. 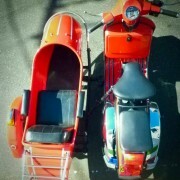 At SS Scooter we are not shy of a challenge, and both my side car and Vespa where stripped back to bear bones and immediately sent to paint and panel. 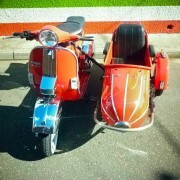 With a bit of a financial incentive the spray painter returned the scooter and side-car back in record time. 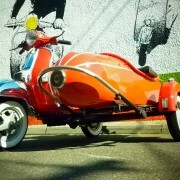 We worked day and night to meticulously rebuild the Vespa and side-car. 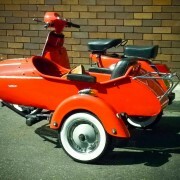 With the steering dampers mounted and side –car perfectly aligned, the scooter and side-car now lusciously coated in their new “”chilli red”” exterior, were ready to hit the roads.